If I were to ask you what the end result of playing a video game is; the answers would probably be one of two things. Either you would say "to have fun", or you would say "to waste time you could be doing something else." I doubt any of you would say that simply playing a video game would result in a long lasting and long distance friendship. This is that story. 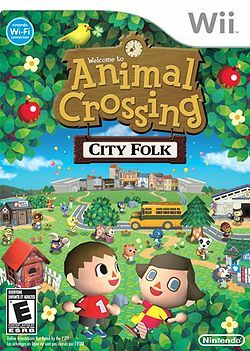 In November of 2008, Animal Crossing City Folk was released on the Nintendo Wii. Having been a fan of the original, I purchased it fairly quickly. I had fun with the game for several weeks and my ex-wife (we were married at this time) had even made a character and enjoyed the game which surprised me. For those of you not familiar with the game, it's a very laid back game where you can fish, explore around town, find items, and decorate your home. There was a particular set of furniture that my ex-wife wanted, the Lovely Set, which was an all pink set of furniture. Of course finding a full set of a furniture style in this game takes a very very long time and she wanted the set so I did what every nerd would do. I consulted the internet! It didn't take me long to find a forum community that was treating all sorts of items in this game like it's own personal black market. People were asking for bells (in-game money) or other items as payment for your desired item. So, I asked for the entire Lovely Set or at least a few items that were needed in hopes someone would be kind enough to help me; someone was. For the sake of this story, let's just call her Emma. Emma was willing to give me every piece that I needed, so I opened up my wifi for the game and she came over dropping off the items. I asked how much she wanted in return and she said that she didn't want any sort of payment back. It struck me at that point that this person was a very nice and selfless individual and someone who I wanted to talk to a little more. And so we talked over that community's private messaging system for several days. Slowly we got to know each other better and I was comfortable inviting her over to the video game forum community I called home. Most people seemed to love her there and it wasn't long before she became a moderator on those boards. We talked daily and really got to know each other. Then one day a month or two later, she decided that I deserved the truth. She knew me well enough to think I wouldn't react poorly to what she was about to say so she took a chance telling me her deepest secret which at that point she hadn't told many people especially online friends. She was born a male. Ever since she was little she felt deep inside that she was a girl trapped inside a man's body and assured me that the things we had talked about and way she acted was not an act. She was free to be herself online since her physical appearance was never shown so I got to experience knowing the "real her" unlike people in her immediate community. It was also during this time that she explained her attraction as "pansexual", a term which I honestly had to look up. The best way i can describe that is that a pansexual can be in love any person of any gender with any circumstances or mindsets the person has. Not that they love everyone per say but that they COULD love anyone they happen to fall in love with no matter what. It was also revealed somewhere around this time that Emma also had a sort of Peter Pan Syndrome, for extreme lack of words here (not doing this justice at all) and she enjoyed "being" a baby and doing baby-like activities, consistently seeing herself as a sort of toddler or small child. Now I, a Christian having been brought up in a Christian home and environment with traditional values, was admittedly a little surprised and though I don't think I admitted it, slightly confused as to how I should react to this information. My subconscious was at war with itself. On the one side I knew that in a general sense I was taught that people like this I was overall supposed to avoid and be separate from because I don't want influences that will deviate me from my walk with Christ. On the other side however, I had grown to enjoy Emma's company, knew her better than some people I knew in person, and is someone I would consider a "good" person. Two things I knew however was that Jesus taught love for all mankind, and that the lifestyle choices of my new friend were of no temptation to me. In end I chose to accept her lifestyle choices as a part of who she is and not allow it to interfere with our friendship in any way even though I personally wouldn't follow any of her lifestyle choices nor do I necessarily agree with many of them. We both gained a mutual respect for each other having our separate opinions and grew a great friendship and in terms of internet forums, a working relationship as well as we were both Admins of the video game forum I brought her to those four years ago. I have had the opportunity to share the gospel to her and she has admitted to being more open to the idea of Jesus because of the love and respect I have given her as opposed to her previous encounters with Christians who were needlessly "holier than thou" and are the kind of believers that give all Christians a bad name. You know the ones! I am happy to say that Emma and I are still good friends today and I would call her one of the best friends I've ever had. We still talk on a weekly basis and still chuckle celebrating her 6th birthday every year over instant messenger. Sure we disagree, sure we are the exact polar opposite of each other, sure some people would say that a Christian shouldn't associate himself with someone of that lifestyle, but that didn't stop me from opening my heart to friendship, showing the love I feel in my heart is right, and having fun in the process. Now this one is going to be a little different and I'm going to preface it by saying that some people will disagree with me. That's perfectly fine. Everyone has their own opinions, beliefs, and leading. This is just one uneducated guy's thoughts so if there is something here you disagree with or dislike then please feel free to disregard that section. It won't hurt my feelings at all. To me, the moral of this story is that we shouldn't let prejudice, fear, differences in viewpoint, or differences in religion hinder us from reaching out to people in love and friendship. Far too often in this country and across the world currently (as well as the past) this has been a massive problem. People getting into fights and arguments with each other when we should just open ourselves up to one another with love and respect. If you allow yourself to be hindered by preconceived notions or unyielding ideologies then you have no idea what you could be missing. Had I acted out of fear or prejudice I would have missed out on one of the best friends I've ever had and she would have missed out on knowing a follower of Christ who wasn't being a bigot towards her for her choices (not to say that she wouldn't have met someone similar naturally anyway of course). To address the issue that I'm sure some of you have about the Christian stance on not associating with people of that nature. It's true. I know the Bible says to not be unequally yolked together with unbelievers. I have heard this message preached over and over throughout my life and the main thing I pull away from it the most is that it will drag us down and deviate us from our path with Christ (I fully admit that I don't know anywhere near as much as I should about all angles of every verse or message in the Bible and if you are honest with yourself you don't either, so there's a very good chance I may have missed something with that teaching). I know that dragging us down and deviating from Christ is a bad thing and something we want to actively avoid as Christians, and I know there are several people out there who would actively drag a Christian down into a deep sin that they are struggling with personally if that person were actively indulging in that sin or encouraging the Christian to do similar. However I feel there is a complete difference in being buddies with someone who drags you down with sins you are tempted with and takes you away from that path Christ has put before you, and befriending someone who may not believe as you do but respects your belief system and does not seek to change your behavior or "drag you down." It has long been my belief that Christians, as ambassadors for Jesus, are to be open, friendly, and accepting to all that cross our path. Far too often Christians are only portrayed as the judgmental people screaming on the side of the road with signs making fools and public spectacles of themselves. That is not an accurate description of Christianity but unfortunately what's the reputation we receive. Does this mean I'm saying we need to rubber stamp every sin that someone has as if it doesn't exist? Absolutely not! But we aren't going to reach anyone or show God's love by being judgmental or acting like a crazy mob... looking at y'all Westboro Baptist. It has also long been my belief that you can show Jesus in your life, and have someone warm up to the idea of Christianity even if religion or Jesus' name is never mentioned a single time. Every single moment you spend with someone can warm their heart and allow you the opportunity to share the gospel. Being a loving friend and someone open to talk about whatever topic that may be troubling them; listening and showing understanding without judgment has the potential to do more good than any other method of reaching the lost. But hey that's just my opinion. In the case of Emma, I have been able to share the gospel more than once with her and I continue to pray that one day soon her "warming up" to the thought of Jesus will turn into an open acceptance of Him. So what is stopping you from extending your hand and your heart to someone new? Are you afraid they won't like you? Are you afraid your differences will cause too much strife? You'll never know unless you try. God will help give you the strength, wisdom, and words to know what to say and do. Even if you are not a person of faith, take a chance on someone new. You might be surprised at all the good you can find out there in the world. Just keep your wits about you. Yet another amazing story! I loved everything about it. You are a truly wonderful person.